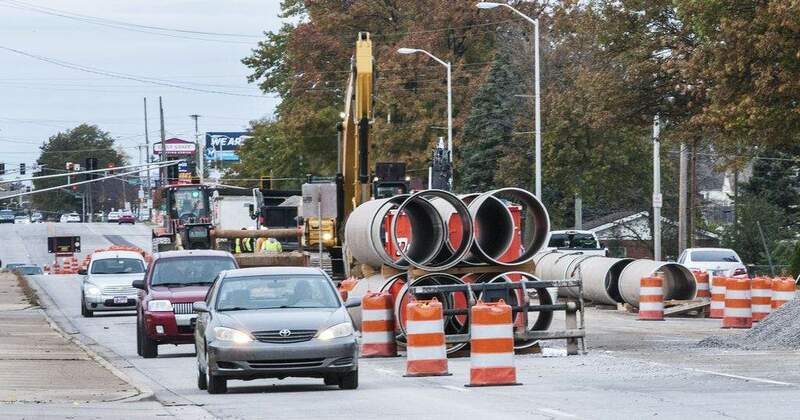 FILE - East State Boulevard between Hobson Road and Coliseum Boulevard was down one lane each way as crews installed a new water line as part of a City Utilities engineering project in 2017. Fort Wayne, Ind. -- Mayor Tom Henry joined residents of the Aboite Meadows Neighborhood Association, the Fort Wayne City Council and City Utilities staff members to announce a hefty investment of $100 million in stormwater protection, sanitary sewer improvements, and water pipe upgrades. Aboite Meadows is an appropriate location for the announcement as a stormwater project to reduce standing water and chronic street flooding is wrapping up. This project adds 67 storm inlets and manholes, 4,100 linear feet of storm pipe and improvements to the nearby outfall in the neighborhood. As promised, City Utilities is moving forward with efforts to replace 70 miles of water mains over the next five years. This year significant replacement projects include North Clinton and the neighborhoods Summerfield Community, Hamilton, Historic Southwood Park, Country Club Gardens and Crestwood Colony. Sanitary sewer improvements will increase capacity in growing neighborhoods and businesses, and continued efforts for consolidation sewers will protect our rivers from combined sewer overflows. This year's sanitary sewer improvements include the areas around Beckett's Run, Rothman Road, W. Rudisill Boulevard, Flaugh Road, Superior Street and capacity improvements at the Water Pollution Control ponds. The stormwater utility will continue its commitment to a five-year plan to implement the announced improvements in 30 neighborhoods, but will also address hundreds of issues throughout the community. The neighborhoods of Brookside Estates, Vesey Addition, Ranchwood Civic, Limberlost Acres, and along Hessen Cassel Road will be the reciprocates of drainage improvements. The total improvement investment from City Utilities is $101,052,289. While some of the projects will be multi-year projects, it will be a heavy construction season throughout the City. Besides Aboite Meadows, current utility work is underway in the neighborhoods of Tamarack Civic and Summerfield Community. Several projects will go to the Board of Public Works for the bidding process in the next few weeks.